Our newly developed COOLmax 500 is capable to save precious Aluminium in-house by cooling down either Al-rich dross from reverbatory furnaces or dry salt slag from tilting rotary furnaces. The COOLmax can roughly process 500kg per hour and can be placed nearby the furnaces to minimize the time before the cooling starts. The main components of our COOLmax 500 are fan, vertical exhaust, motor, control unit and aircooled double-walled cooling mechanism and dross/slag container. Hot dross from reverbatory furnaces or dry salt slag from Tilting Rotary Furnaces can be filled directly into the COOLmax dross/slag bin. The bin will be instantly transported by a forklift to the COOLmax which is preferably nearby the furnaces. 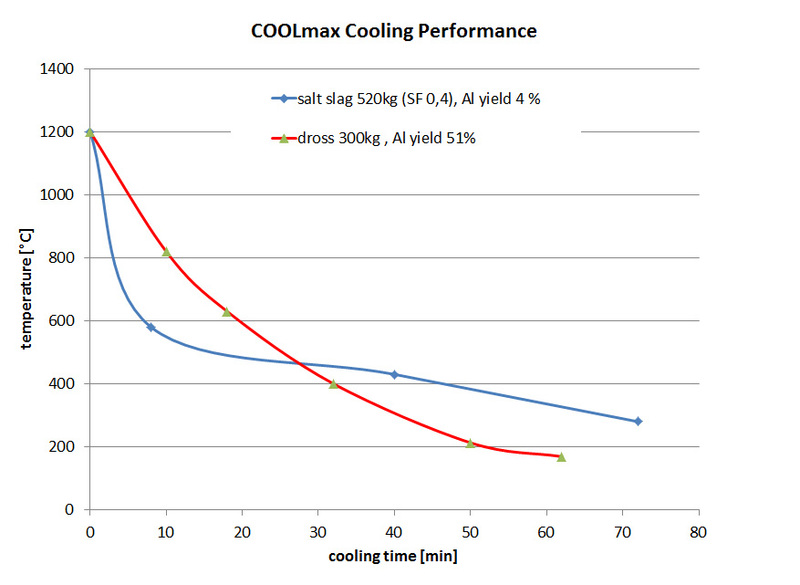 After the dross/slag container has been connected by hydraulic force to the COOLmax, the machine starts to cool down the dross/slag via a patented system of aircooling and milling. After the combined cooling of less than 1h below 350°C and milling the residuals can be sieved and the aluminium can be used for most efficient inhouse recycling.